Is your USB flash drive suddenly showing less GB in disk space than actual? Did your 16GB or 8GB USB pen drive suddenly became 3GB, 0.99GB, 64MB, 30MB, or 4MB? Is your USB pen drive showing unallocated space? Then you are on the right page because this tutorial will show you step by step how to fix these problems without using any special software, but by using two tools that are already built-in Windows XP, Vista, 7, 8, 8.1 and 10. This tutorial will work for all USB pen drive brands, such as Kingston, SanDisk, Toshiba, Lexar, HP, PNY, Transcend, Freecom, and all other brands. Important! Copy all data (documents, pictures, videos, music, etc.) from the USB flash drive to another USB pen drive or hard drive because all data will be erased. Warning! Diskpart is a very powerful tool. You need to be 1000% sure that you select the right disk because if you delete the partition on the wrong disk you might delete the Microsoft Windows partition or another important partition. Warning! Disk Management is a very powerful tool. You need to be 1000% sure that you select the right disk because if you change, format, or delete the partition on the wrong disk you might delete the Windows partition or another important partition. 1. Open Windows Command Prompt. Press the [Windows] + [R] key, enter cmd, and then press Enter. Click on the start menu button, click on Run, enter cmd, and then click on OK. Type cmd in the Windows search bar and then press Enter. On Windows 10, you right-click on the start menu button and choose Command Prompt (Admin). 4. Now you will see a list with all the drives of your computer and the USB drive that's connected to your computer. Take a good look and make sure you know exactly which one is your USB pen drive. In the example on this page, is Disk 1 my USB flash drive, but this doesn't mean that Disk 1 is also your USB thumb drive. 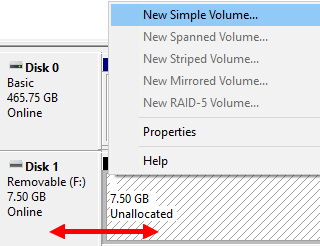 Now you will see the partition(s) on the selected drive. If you get the following message: Diskpart successfully deleted the selected partition, then continue with the following steps. If you get the following message: Cannot delete a protected partition without the force protected parameter set, then visit this page from HowToGeek (link opens in a new tab). 11. Open Windows Disk Management. Enter disk management in the Windows search bar and press Enter. Click on the start menu button, right-click on Computer, choose Manage and then click on Disk Management on the left side. Click on the start menu button, open Control Panel, open System and Security, open Administrative Tools, open Computer Management and then click on Disk Management on the left side. On Windows 10, you right-click on the start menu button and choose Disk Management. Usually, it's easy to locate, because it will be shown as Removable with unallocated disk space. 13. Right-click on your USB drive and choose New Simple Volume. A New Simple Volume Wizard window will appear. 15. Check if the maximum disk size is selected and click Next. 16. Select a drive letter (optional) and click Next. 17. 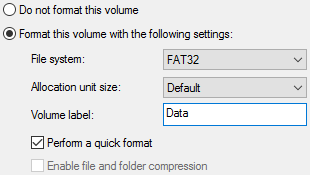 Make sure FAT32 is selected as File system. 18. At Volume label, you enter a label name. Windows will create a new volume.